Christian leaders took the rare step on Sunday of closing Jerusalem's Church of the Holy Sepulcher, built where tradition holds Jesus was buried, in protest at Israeli tax measures and a proposed property law. It was not clear how long the closure of the church, announced by Christian officials at a news conference from around noon (9 a.m. Manila time) , would last. Church officials said only that it would be until further notice. 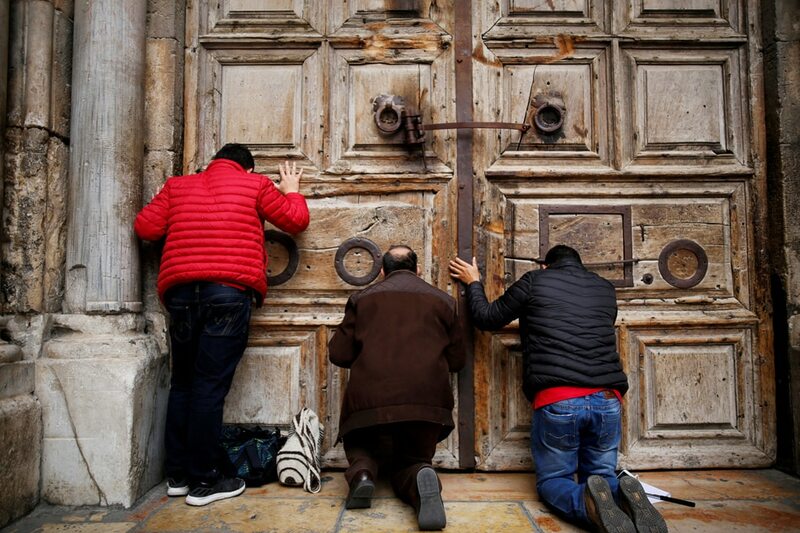 "As a measure of protest, we decided to take this unprecedented step of closure of the Church of the Holy Sepulcher," Greek Orthodox, Armenian Apostolic and Catholic leaders said in a statement read out in front of the church's large wooden doors. They said recent Israeli measures seemed to be "an attempt to weaken the Christian presence in Jerusalem". A spokesman for the Palestinian Authority condemned the move as a "new aggression against the city of Jerusalem" that could see Israel exert control over land belonging to churches. The decision to close the church was extremely rare. In 1990, Christian sites including the Holy Sepulchre were closed for a day to protest the installation of Jewish settlers near the church, located in Israeli-annexed east Jerusalem. Christian sites were shut for 2 days in 1999 to protest the planned construction of a mosque near Nazareth's Church of the Annunciation, where tradition holds the Angel Gabriel announced to Mary she was to become the mother of Jesus. "This reminds us all of laws of a similar nature which were enacted against the Jews during a dark period in Europe," the statement said. An Israeli ministerial committee on Sunday delayed action on the bill for a week. Confused tourists stood in front of the church's closed doors in Jerusalem's Old City after the announcement, as tour guides sought to explain why they could not visit. One man knelt and prayed as workers began putting metal barriers around the entrance. Jerusalem Mayor Nir Barkat said in a statement that the city was due 650 million shekels ($186 million, 152 million euros) in uncollected taxes on church properties, which he called "illegal and irrational". Barkat stressed the Church of the Holy Sepulcher and all other churches were exempt from the taxes and would remain so, with the changes only affecting establishments like "hotels, halls and businesses" owned by the churches. Christian leaders say the measure jeopardizes their ability to conduct their work, which includes not only religious but also social services to those in need. According to Israeli media, the foreign ministry has been critical of the Jerusalem mayor's decision on church taxation. Officials have said the move was harmful to a decades-long status quo. A separate bill seeks to allay the fears of Israelis who live in homes on lands previously held by the Greek Orthodox Church and which were sold to private developers, according to Rachel Azaria of the centrist Kulanu party, who is proposing the legislation. Recent land sales by the Greek Orthodox Church -- a major landowner in Jerusalem -- to unknown buyers have drawn fire from both Israelis and Palestinians. Palestinians fear the sales will favor Israeli settlement construction in east Jerusalem, while Israelis are concerned over private developers' intentions for the land. A Russian tourist in her 20s who only gave her name as Elona said "it is very disappointing" that she could not visit the church on Sunday. "It is one of the main religious attractions, and to us it was very important to visit it because it is our first time (here)," she said. She said she does not feel "her mission is accomplished" as she was only visiting for a few days. The cave where Christians believe Jesus was buried is located within the church, while the traditional site of his crucifixion is a short walk away, also inside the church. The tomb is encased in an elaborate shrine, whose recent restoration was unveiled in March 2017 after months of delicate work. A 19th-century shrine surrounds the tomb with an onion-shaped dome above. The Greek Orthodox, Armenian and Roman Catholic denominations share custody of the church.